I think I could eat Thai food every day of the week and I probably make some version of this recipe at least a few times a month. Those sweet, salty, tangy flavours just have me hooked it and somehow the more Thai food I eat, the more I want to eat! Talk about a vicious (delicious) circle. This quick and easy curry is perfect for weeknights; I use a store bought paste and bolster the flavours with plenty of fresh herbs and some ginger and garlic to bring it to life a little bit. Heat the oven to 190C, peel and cube the butternut squash and roast with a sprinkling of salt, pepper and chilli flakes, if you have them. Leave the squash for about half an hour - tidy the flat, make tomorrow's to-do list, do a workout, etc. After half an hour, slice the garlic, peel and grate the ginger and finely slice the coriander stems. Fry in a large wok with the curry paste and add a few spoonfuls of the coconut milk to simmer. 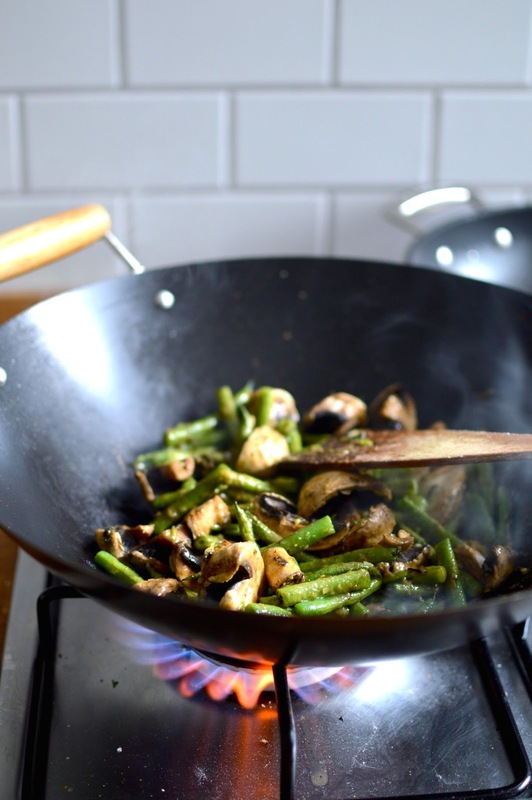 Slice the mushrooms and beans and add to the wok. Stir fry for a few minutes until slightly softened. Pour in the rest of the coconut milk and simmer on a low heat for 10 - 20 minutes or until thickened to your taste. Meanwhile, boil the kettle and soften the rice noodles according to the packet instructions. Drain and rinse under cold water. Take the squash out of the oven and toss through the noodles. If you're using eggs, heat some butter in a non-stick pan and fry the eggs with a sprinkling of turmeric and a pinch of salt and pepper. Squeeze the limes into the curry, serve over the noodles and squash and serve with the egg and a generous handful of coriander leaves and another squeeze of lime. Apart from the time spent waiting for the squash to cook, this recipe is quick and easy and the leftovers are delicious for lunch the next day. Oooh yum! Can you cook for me every night please?